Most Trident collectors have heard of "Dzenis" Reprints and they are separately listed in Bulat's catalog. 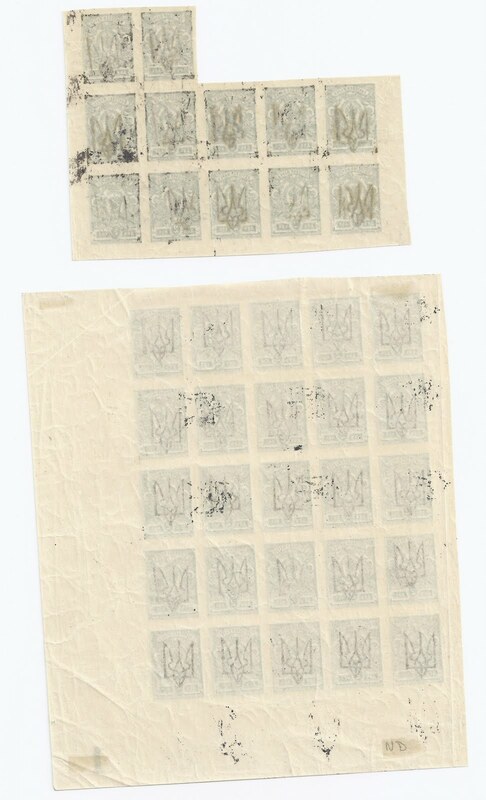 Dzenis was a Riga stamp dealer who, I guess, was able to travel to Bolshevik Kharkiv during the Bolshevik occupation of Riga in 1919. The reprints made for him had postal validity. Sometimes Dzenis reprints are on different basic stamps from original Trident overprints and so are easily distinguished. 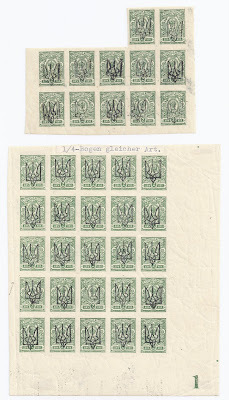 But when they are on the same basic stamps, they are not always easy to distinguish - but Bulat catalog values are often very different. In Dr Seichter's 1960 pamphlet "Bezirk Charkiw" he discusses how to distinguish originals and reprints. Also in Dr Seichter's collection was the quarter sheet with a typed note attached. Unfortunately, we do not know to what "gleicher Art" refers but I guess it means "Reprint" - and on the back of this block, Ron Zelonka has pencilled "ND" [Neudruck = Reprint]. So this is Bulat 769 catalogued at $10. 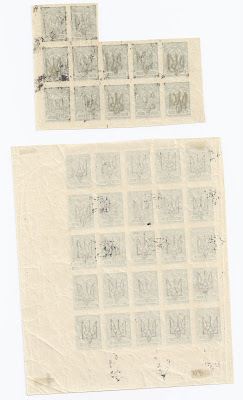 The ink is matt, greyish and does not penetrate to the back of the stamps. This is typical of most Reprints but not all. As important in this case, the Handstamp used is not the same as the IIIg used on the originals. And the shade of the basic stamp is different.